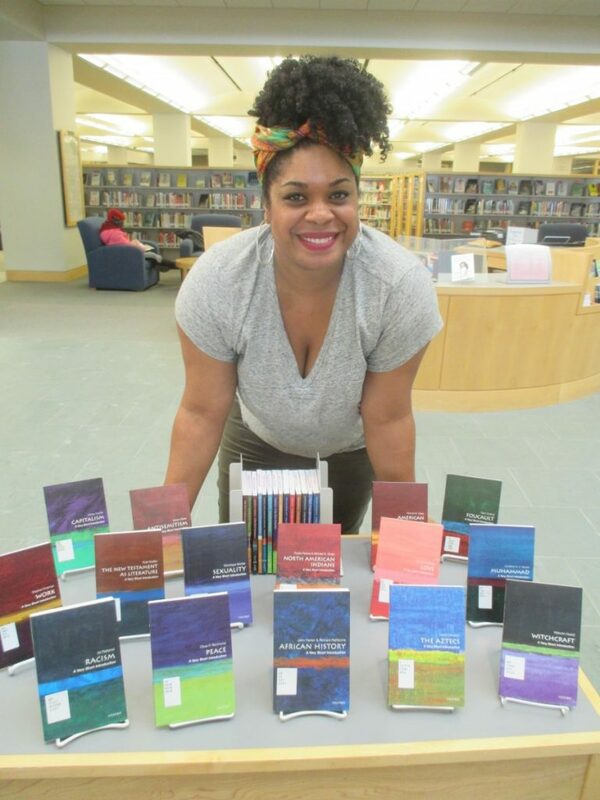 Literatures & Cultures Librarian Katrina Spencer poses with the Very Short Introductions display. With more than 500 titles, these works represent one of the libraries’ most diverse collections. Hey, there’s a new display up of Very Short Introductions to usher in the New Year. Come check it out, January 3rd- 26th! Katrina (Literatures & Cultures Librarian), what are these books? This entry was posted in Library News, libspotlight, LIS Staff Interest, lisblog, Middlebury Community Interest, middpoints, Post for MiddNotes, Post for MiddPoints and tagged display, Library Spotlight, libspotlight, Marlena Evans, Very Short Introductions on January 5, 2018 by Katrina Spencer.